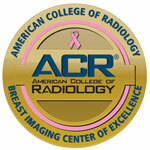 Find all of the breast care you need in one place that happens to be close to home. The Southcoast Breast Center offers a whole new way of getting answers about your breast health through a connected continuum of diagnostics, treatment, preventative care and more. If you have an abnormal mammogram or just want to get a better picture of your breast health, the breast center offers an integrated approach to care, so you can get the answers and support you need without stressful delays. Our breast cancer specialists and surgeons closely collaborate with specialists — including oncologists, plastic surgeons, radiologists, pathologists and rehabilitation specialists — to quickly diagnose any issues, develop a plan of action and care for you. You can also take comfort knowing that our breast care navigators will guide you through the entire process, step-by-step. They can also work with you to assess your risk and help address lifestyle changes, such as diet and exercise, to help reduce your risk. The Breast Center works closely with Southcoast’s 10 digital mammography sites and three advanced diagnostic locations — all accredited as Centers of Excellence by the American College of Radiology — to give our patients comprehensive care unlike any other in our region. Our center is also accredited by the National Accreditation Program for Breast Centers (NAPBC) for our achieving the highest standards of patient care. Let us make your breast health a priority by helping you find a doctor who specializes in breast health. Or, schedule an appointment for your annual mammogram in Fall River, Dartmouth and Wareham, MA, as well as areas across the South Coast. We also work very closely with the Southcoast Centers for Cancer Care, and we regularly hold multi-specialty tumor boards to review new cases and develop a collaborative approach to personalized treatment. Our breast center has received a three-year full accreditation by the National Accreditation Program for Breast Centers, a program administered by the American College of Surgeons. 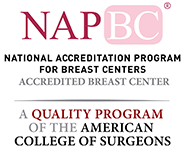 Accreditation by the NAPBC is only given to centers that have voluntarily committed to provide the highest level of quality breast care and undergo a rigorous evaluation process and performance review. Explore our offerings and locations, and contact your nearest Southcoast Breast Center at 855-749-3349 to schedule an appointment. Through the Southcoast Breast Center, Southcoast Health provides leading-edge breast care and services to women across southeastern Massachusetts and parts of Rhode Island.